(June 5, 2017 – Langley, B.C.) 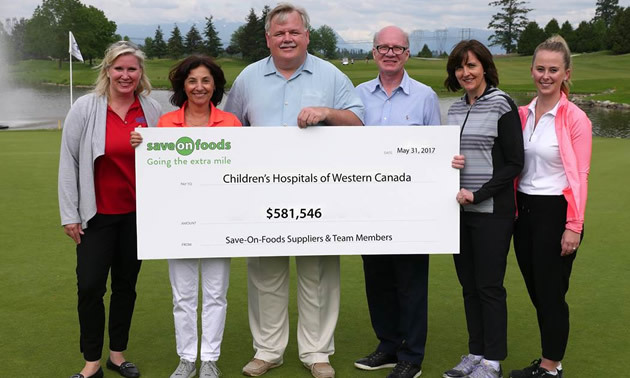 Together with their supplier partners, the team at Save-On-Foods helped to raise $581,546 at last week’s 22nd annual Save-On-Foods Charity Golf Tournament at Northview Golf and Country Club in Surrey, B.C. The sold-out tournament saw 360 golfers come together to support the five children’s hospitals in Western Canada: BC Children’s Hospital, Alberta Children’s Hospital, Stollery Children’s Hospital, the Jim Pattison Children’s Hospital in Saskatchewan, and the Children’s Hospital of Manitoba. Pictured, from left: Alberta Children’s Hospital senior director of community initiatives & events Liz Ballendine; BC Children’s Hospital president & CEO Teri Nicholas; Save-On-Foods president Darrell Jones; Children’s Hospital Foundation of Manitoba president & CEO Lawrence Prout; Stollery Children’s Hospital Foundation vice president Karen Faulkner; and Jim Pattison Children’s Hospital Foundation director of donor relations Jana Len. Save-On-Foods is committed to Going the Extra Mile for customers in every community served, every day. Known for its unique approach in customizing each store to best suit the needs of the neighbourhood by carrying more than 2,500 locally-made products from more than 2,000 local growers and producers, the company has been innovating and putting customers first for over 100 years.